Hickory cabinets feature dramatic wood colors within a piece due to the heartwood and sapwood of this wood type. The color may range from blonde or white to reddish-brown and dark brown. This naturally contrasting appearance adds to their appeal in many kitchen designs. 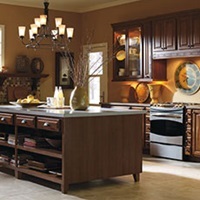 Hickory kitchen cabinets feature a smooth, extremely strong, close-grained wood with a heavy, flowing grain pattern. Hickory’s grain is usually straight but can be irregular and wavy at times. The wood has a rugged appearance and coarse texture. Characteristics include pinholes, knots, burls and color streaks. 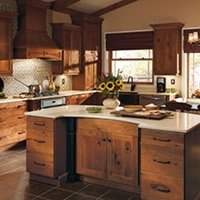 Rustic hickory cabinets are more radical in color and grain variation, featuring irregular and wavy patterns. Their beauty is enhanced by random wormholes, knots, picks, mineral streaks and burls, which add to its natural charm and rustic appearance.